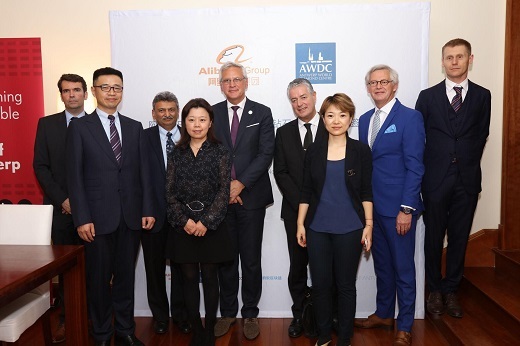 RAPAPORT... Chinese e-commerce giant Alibaba will collaborate with the Antwerp World Diamond Centre (AWDC) to bring Belgian diamonds to Chinese consumers. Through the partnership, Shape of Antwerp diamonds will be sold exclusively on the Chinese retailer’s Tmall online marketplace. “Chinese consumers love Antwerp diamonds, and China is the second-largest market in the world for polished diamonds,” the AWDC said Tuesday. After selecting a stone, consumers can have the diamond set into a design of their choice, the AWDC explained. Diamond lab HRD Antwerp will certify all stones in the Shape of Antwerp collection, and will also laser-engrave a tamper-proof QR code onto the girdle of each diamond before it is set. Consumers can scan the QR code to follow their diamond’s journey from Antwerp to China using the platform’s blockchain technology. Last month, Alibaba also signed an agreement with Richemont, which will make the Swiss luxury retailer’s Net-a-Porter and Mr Porter platforms available through Tmall. The Chinese e-commerce group also announced an expanded collaboration with the Israel Diamond Exchange (IDE) to sell its loose stones on Alibaba’s Ali Auction site. Alibaba and the AWDC signed the deal earlier this week at the first China International Import Expo (CIIE) in Shanghai.